This is our third, and final, review as Cosatto brand buddies (weep! I need to have more babies so that I can carry on!). Over the course of the last six months I really have found my absolute favourite baby brand in Cosatto; there's no doubt about that. I love everything about them - their ethics, their advertising - and, of course it goes without saying that it's their products that I adore most of all. We are already the proud owners of the Cosatto Ooba Kimono travel system, the Pretzel high chair and, a month ago, we added the Babushka Story Cotbed to our collection. We all LOVE it. I'm a huge fan of colour, which is probably why I adore everything Cosatto so much. Evie's previous cotbed was a traditional, white one, which had been handed down from Daisy. Daisy actually made the move from cot to cotbed at eighteen months but there was no chance of me letting Evie do the same. Every child is different and Daisy was very good at bedtime so removing the cot bars really wasn't a big issue at all. Evie, on the other hand, is a MONSTER at bedtime and I want her to stay in a cot for a while longer. Which brings us onto the Cosatto cotbed! I loved it from first glance; the vibrant red colour, the matryoshka doll design (I collect them! ), the fact it's girlie without being pink. Then there's the three mattress heights, the extra storage by way of under bed drawer, the space saving over cot changing mat - three really thoughtful details that make a massive difference. 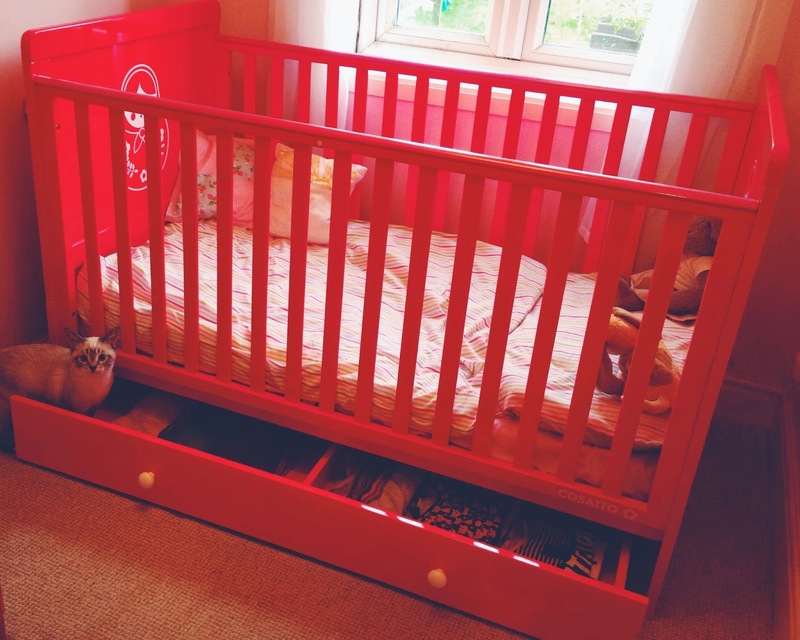 I think the thing I love the most is the fact it has an in-between stage for when you're starting the cot to bed transition; you can remove just one side of the cot and keep it as a sofa/day bed - and I'm hoping that by keeping one set of familiar cot bars it will make the change that little bit smoother. So we have been using our cotbed for a couple of weeks now. 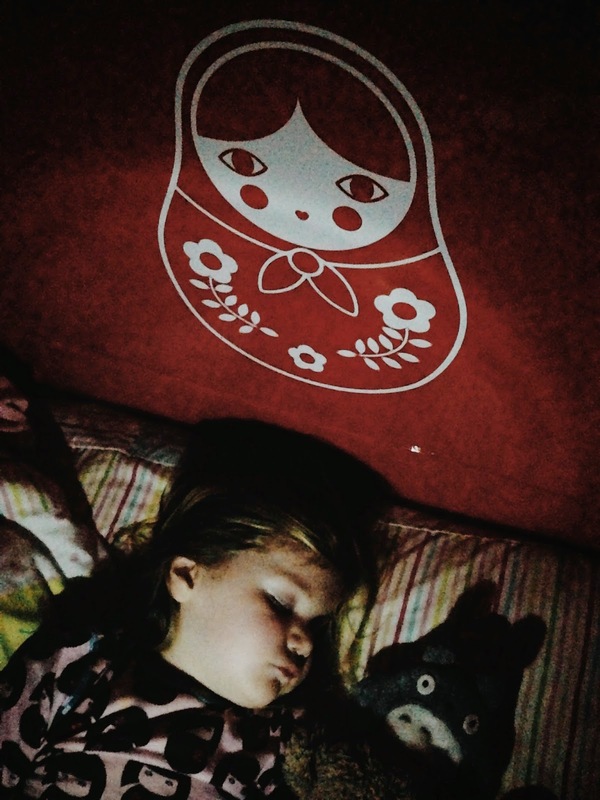 You all know that Evie is a terrible sleeper, and I'm not going to say 'IT'S A CHRISTMAS MIRACLE! SHE IS NOW SLEEPING THROUGH THE NIGHT!' because it would be a bit fat lie. I can - very happily - confirm, however, that bedtime is now a joy and she absolutely loves going to bed. I don't think that's a coincidence! OMG how amazing is this!